Every experience we have will leave some impression that is stored somewhere physically in the nervous system. If the impression is deep, we can feel this clearly, for example, a “knot in the heart” when we have had a fight with somebody. We could compare this with a blackboard. When we wake up in the morning, the board is empty but every experience that we go through throughout the day is like an additional little drawing. At a certain moment, the board is full and the nervous system can’t go on anymore. The board has to be wiped clean again. Fortunately, the body has a completely natural, automatic process to do so – when the body is at rest during sleep. So, relaxation literally means that tensions are relaxed and impressions are removed. The problem, however, is that there are too many impressions in our busy lives. The rest during the sleep is not sufficient to remove them all. Also, the rest during sleep often also does not seem to go deep enough to eliminate deeper impressions – for example, that knot in the heart after we had a fight with someone. The next morning, we might feel that the tensions are a bit less but they have not disappeared completely – the sleep was not sufficient. Those tensions, which cannot be neutralised through the rest provided during sleep, will accumulate over time. Eventually, they disturb the natural functioning of the body, which, in turn, results in all sorts of mental and physical problems. These disturbances can manifest, usually through our genetic “weakest link” – some people will get heart problems while others will sink into a depression. But the genetic condition is not the cause, rather it will define where the true cause, the inability of the body to clear itself of elements that disturb it’s natural functioning, will manifest itself. These disturbances are regarded as a key cause, direct or indirect, of many physical or mental health problems. During the experience of transcending, the mind gets in a state of complete inner silence – see Being Yourself. Mind and body always go together. Where one goes, the other must follow. By allowing the mind to be effortlessly drawn to this complete inner peace, we literally pull the body into a very deep state of rest, much deeper than the rest that we experience during sleep. This can easily be measured objectively. 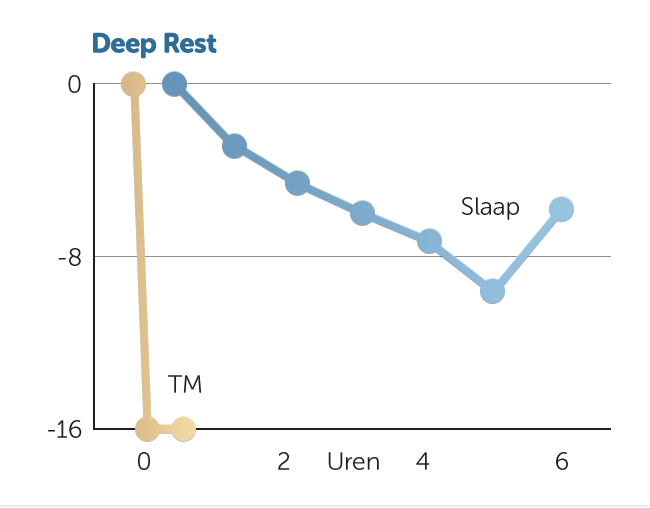 Rest experienced during TM is deeper than that obtained during sleep. 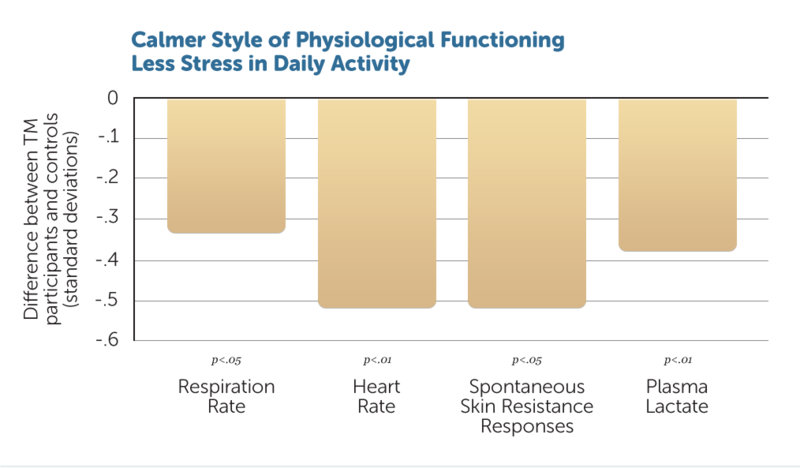 This graph shows a study from Harvard Medical school in which the resting state is measured on the basis of oxygen consumption. We see that, during TM practice, the body goes into a state of rest much faster and much deeper than the rest that is usually achieved during sleep. This remarkable study was published in 1971 in two well-known scientific magazines, ScienceRef.Science 27 Vol. 167 no. 3926 pp. 1751-1754 1970 and Scientific American. Ref.Scientific American 226:84-90 1972 It was repeated several times around the world with similar results. 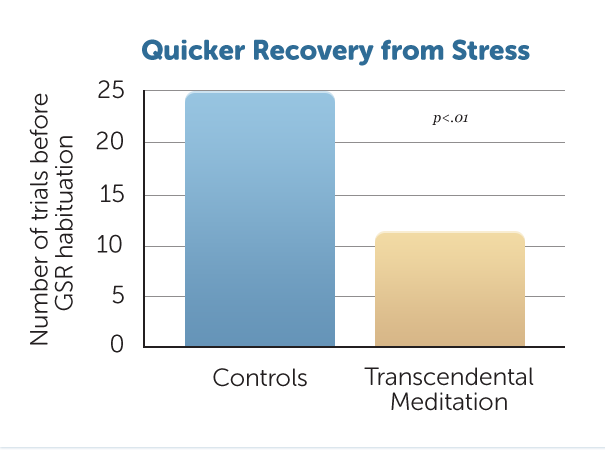 A later publication of a larger analysis of 31 TM studies confirmed the exceptionally deep state of relaxation attained by practicing TM – a state a lot deeper than that gained in normal, eyes-closed rest Ref.American Psychologist 42: 879–881, 1987 whether measured through breath rate, heart rate or plasma lactate. As a result of such deep rest, the body can start to heal itself from the deeper stresses – even our deepest traumatic stresses – that years of sleep (or therapy) can’t touch. If the body can eliminate the tensions that disturb its normal functioning, then the ground is set for the problems related to those disturbances to spontaneously improve. Some of the most impressive effects, however, were found with people who also had the deepest problems – war veterans and refugees who were suffering from severe Post Traumatic Stress Disorder (PTSD). The deep-rooted, traumatic stresses implicated in PTSD are generally considered incurable and, in some cases only, the symptoms can be suppressed with therapy or heavy medication. Yet, a number of published scientific studies have suggested a highly significant decrease or even complete disappearance of PTSD symptoms, in some cases after only 4 to 12 weeks of TM practise Ref.Journal of Counseling and Development 64: 212–215, 1985 Ref.Military Medicine 176 (6): 626-630, 2011 Ref.Journal of Traumatic Stress. 2013:1-14 – for more info see PTSD. The subjects of these studies have been exposed to the most intense stress and traumas. These studies indicate the true power of our bodies to heal themselves we if only we can activate that power. It’s reasonable to assume that, if through TM practice, such deep traumas can be relieved, those suffering from lesser degrees of stress and trauma can also find relief. Stress creates a vicious circle: More stress creates more stress. Transcending can help to turn this circle around. If the body starts to remove stress, it can start to function more normally. More normal functioning means that we spontaneously remain more calm, more ourselves. Rest neutralises stress. So, if we can remain calm continuously, stress will simply make less of an impression on us. The body will become more and more efficient in removing stress, not only during meditation but even during what is ordinarily stressful activity. It is like drawing a line on water – while we draw it, it is automatically removed. – The Stress Hormone, Plasma Lactate. Reduction of stress, in itself, is actually a side benefit of what really happens – we get back in contact with our true inner nature and everything inappropriate starts to melt away – see transcending = the highest human experience.